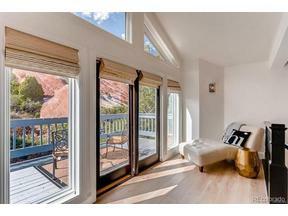 Just Completed Remodel of this custom home nestled in the red rocks with breathtaking views from every floor. Enjoy the privacy and peace of mind found in mountain living while only steps to the 16th hole and a short 25 minute commute to downtown. This home has been transformed into a grand showcase property offering: All New Windows and Sliders~5 Newly Renovated Bathrooms~All New Flooring including Wide Plank French Oak on the main and upper levels, New Tile in the kitchen, entries, mudroom, laundry and baths~ New High End AquaGuard laminate throughout entire walkout basement~All Staircases newly updated ~New Chandeliers and Light Fixtures everywhere inside and out~New Main Floor Laundry ~New Mudroom~New Home Theater~New Appliances~New Garage Doors~New Interior Paint~Upgrades to Electrical and HVAC~50 year Stone Coated Steel Roof~5 Large Bedrooms with a 6th Bedroom/2nd Office option~5 View Decks~5 Fireplaces~ Large flat backyard backing to private hiking and mountain biking trails.